This is a root class for typeless data in the IR. Definition at line 57 of file Metadata.h. Definition at line 77 of file Metadata.h. Definition at line 65 of file Metadata.h. Definition at line 83 of file Metadata.h. 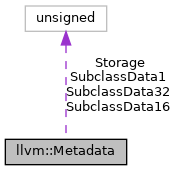 If M is provided, metadata nodes will be numbered canonically; otherwise, pointer addresses are substituted. Note: this uses an explicit overload instead of default arguments so that the nullptr version is easy to call from a debugger. Definition at line 4383 of file AsmWriter.cpp. Referenced by llvm::DebugLocEntry::Value::dump(), llvm::LexicalScope::dump(), getMetadataID(), and llvm::NamedMDNode::getParent(). Definition at line 4386 of file AsmWriter.cpp. References llvm::dbgs(), LLVM_DUMP_METHOD, and print(). Definition at line 99 of file Metadata.h. References DEFINE_ISA_CONVERSION_FUNCTIONS, dump(), print(), and printAsOperand(). Referenced by llvm::DINode::classof(), llvm::GenericDINode::classof(), llvm::DISubrange::classof(), llvm::ValueAsMetadata::classof(), llvm::ConstantAsMetadata::classof(), llvm::DIEnumerator::classof(), llvm::LocalAsMetadata::classof(), llvm::DIScope::classof(), llvm::DIFile::classof(), llvm::MDString::classof(), llvm::DIType::classof(), llvm::DIBasicType::classof(), llvm::MDNode::classof(), llvm::DICompositeType::classof(), llvm::DISubroutineType::classof(), llvm::MDTuple::classof(), llvm::DICompileUnit::classof(), llvm::DILocalScope::classof(), llvm::DILocation::classof(), llvm::DISubprogram::classof(), llvm::DILexicalBlockBase::classof(), llvm::DILexicalBlock::classof(), llvm::DILexicalBlockFile::classof(), llvm::DINamespace::classof(), llvm::DIModule::classof(), llvm::DITemplateParameter::classof(), llvm::DITemplateTypeParameter::classof(), llvm::DITemplateValueParameter::classof(), llvm::DIVariable::classof(), llvm::DIExpression::classof(), llvm::DIGlobalVariable::classof(), llvm::DICommonBlock::classof(), llvm::DILocalVariable::classof(), llvm::DILabel::classof(), llvm::DIObjCProperty::classof(), llvm::DIImportedEntity::classof(), llvm::DIGlobalVariableExpression::classof(), llvm::DIMacroNode::classof(), llvm::DIMacro::classof(), llvm::DIMacroFile::classof(), llvm::MDNode::clone(), llvm::MDNode::dropAllReferences(), forEachUser(), hasSelfReference(), llvm::ReplaceableMetadataImpl::replaceAllUsesWith(), and llvm::MDNode::storeDistinctInContext(). Default handling of a changed operand, which asserts. If subclasses pass themselves in as owners to a tracking node reference, they must provide an implementation of this method. Definition at line 94 of file Metadata.h. Definition at line 4340 of file AsmWriter.cpp. Referenced by createCast(), getMetadataID(), llvm::NamedMDNode::getParent(), llvm::operator<<(), llvm::ValueEnumerator::print(), and llvm::VerifierSupport::VerifierSupport(). Definition at line 4346 of file AsmWriter.cpp. Definition at line 4330 of file AsmWriter.cpp. Referenced by EmitHiLo(), getMetadataID(), llvm::MachineOperand::print(), and llvm::MachineMemOperand::print(). Definition at line 4335 of file AsmWriter.cpp. Definition at line 58 of file Metadata.h. Definition at line 71 of file Metadata.h. Storage flag for non-uniqued, otherwise unowned, metadata. Definition at line 68 of file Metadata.h. Referenced by adjustColumn(), isCanonical(), llvm::MDNode::isDistinct(), isOperandUnresolved(), llvm::MDNode::isTemporary(), llvm::MDNode::isUniqued(), llvm::MDNode::replaceWithDistinct(), and llvm::MDNode::storeDistinctInContext(). Definition at line 73 of file Metadata.h. Definition at line 74 of file Metadata.h. Referenced by llvm::DistinctMDOperandPlaceholder::DistinctMDOperandPlaceholder(), llvm::MDTuple::getHash(), and llvm::DistinctMDOperandPlaceholder::getID().